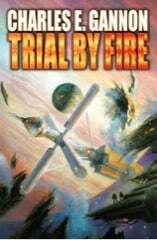 Trial by Fire, the next book in the Tales Of The Terran Republic, was released in August of 2014. But as Earth hurtles towards a final trial by fire that is certain to scar its collective memory, Caine discovers that there may also be large and disturbing gaps in that memory. Clues point to a much earlier inter-species apocalypse, buried in humanity’s own prehistory. Which raises a terrifying possibility: what if the aliens’ invasion of Earth is not one of conquest, but preemption? And what if their harrowing memories of a long-past cataclysmic war makes them willing to do anything to keep it from reigniting?